A small change can bring a marvelous difference in the overall beauty of your home space. Be it a bathroom mat, embellished cushion or table linen, such utility accessories are a great add on to any home space. Since designer table runners come in a wide assortment of colors, sizes and styles therefore giving you multiple options to adorn your dining area according to your likings. These mats are not just a covering for your valuable asset but add great value in its overall look. Whenever you gather at a place with your family these table covers create a warm ambience, filling the mood of members with positive vibes. They are one of the greatest decor items available in lower prices for your precious table. These mats come in trendy design and add modern touch to your asset and interiors as well. In the modern time, bare table kept in any space gives a humdrum feel and let put your mood down. If you are sitting with your family or friends while gossiping with a cup of tea or coffee just place these mats over the desk for an energizing experience. Having classy appearance and exclusive style, they are a good way to dress up your dining linen. The high quality fabric used in the manufacturing of these mats enable you to utilize them for a longer period without too much maintenance. With eye catching patters and beautiful themes, they bring positive vibes to the dining zone and illuminate up the home interiors. At Swayam India, they are available in different sizes ranging from small to full length and perfectly suit any kind of table. Having high appeal and ethnic look they are sure to fetch lots of compliments for you. 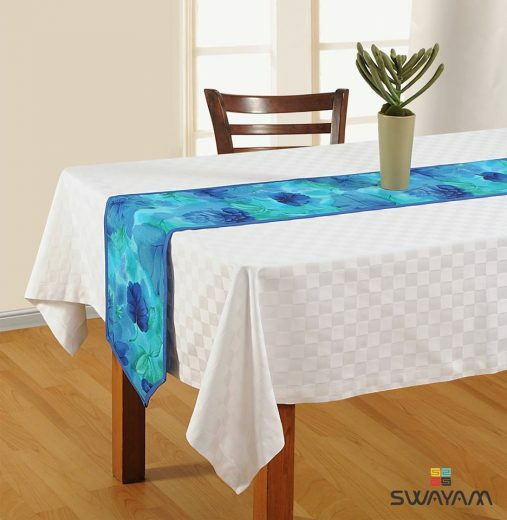 When it comes to functionality, these table runners are also useful in maintaining hygiene all around where you have kept your food and water. Cleanliness is the primary priority when you are sitting around a table while having tea or coffee. They are a great addition to any dining linen for a royal experience.